Come join Shamanic Healing Voices Meditation on Wednesday March 27th for an uplifting class intended to release your chakras and body from negative vibrations, and realign yourself spiritually, mentally, and emotionally. This special class is entitled “COMING OUT” and you should not miss it. This will be on Wednesday March 27th, at 7:30pm @mostlyangelsla located at 2602 S Robertson Blvd Los Angeles CA 90034. Class donation is $25. To Sign up email afimayegalarraga@gmail.com. Mostly Angels LA is a very nice cozy small spot so signing up is highly recommended due to space restrictions. Come discover what Spirit has to share with you! I am super excited to announce this upcoming class. Nothing gives me more excitement than to support people who are truly walking in their dream. Needless to say it’s even more thrilling when it’s someone I mentor. Shamanic Healing Voices Meditation is coming together with @urbanyogi.la for this super spiritual and uplifting class. Urbanyogi is not only my mentee and someone I Spiritually advise, he’s also my Spiritual Godson. His breath-work is amazing! COME CONNECT WITH SPIRIT through a guided breath-work meditation w/ @yogitwan1177 @urbanyogi.la and a Shamanic Healing Voices group Meditation/Reading with yours truly. This will be a great way to deepen your connection with your inner-spirit, cleanse your body from negative vibrations, calm your anxiety, and receive much needed guidance from the Universe on being able to continue conquering 2019. The Shamanic Healing Voices Meditation and group reading will be done as a group. Spiritual channeling will take place in a collective manner and you shall receive messages (however they come through) for you. Come prepared to be touched by Spirit in a magical way. That’s on March 11th, 2019 from 8pm to 10pm (YES, 2 hours). Location: 652 Robin Glen Drive Glendale CA 91202. Donation: $100 2-hour guided Breath-Work and Shamanic Healing Voices Meditation and Group Reading. RSVP, LIMITED Spaces for this intimate event! Only 25 spots available and it will go fast! Email me at afimayegalarraga@gmail.com for information on how to pay in advance to reserve your spot. Who’s ready for 2019’s first Shamanic Healing Voices Meditation?? I hope you are. Spirit has so much to share with you this year and we are kicking it off with a powerful class entitled, CHISEL THROUGH IT. If you are attempting to give 2019 the best chance and still feel negative energy lingering over you and holding you down, this is your class. If you are out of resources, this is your class! If you are feeling hopeless and are lacking the drive you need to keep believing in yourself, this is your class! If you are feeling good but also feel like you have no direction, this is your class! Don’t procrastinate! Don’t hesitate! Don’t make excuses! 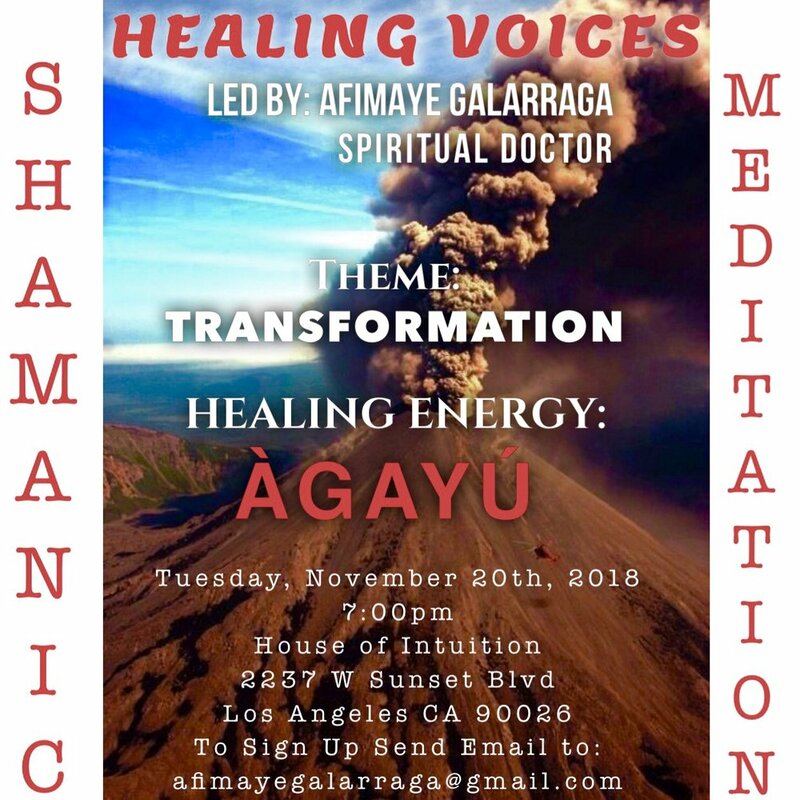 Come join Shamanic Healing Voices Meditation on Friday, February 22nd at 7:30pm at GypsyLuv Metaphysical Shop located at 844 E Mission Blvd Pomona CA 91766. Class is $20. To Sign up, Email: afimayegalarraga@gmail.com. Looking forward to seeing you there. Come join us in our next Shamanic Meditation and Healing W/The Voices class honoring and channeling the energy of the sacred WEST-AFRICAN ÒRÍSHAS! This is definitely a powerful and super-charged class you don't want to miss! This class is entitled REDESIGN YOUR PATH! Through the healing vibration of the West African energy ÈLÉGBA, the king of the crossroads and of path and direction, we shall download the divine guidance that will help you redesign your path and embark on your new journey.